Mixed-use developments can transform the suburbs into more livable communities. Photo by citta-vita. Live blogging from the American Society of Landscape Architects 2010 Expo and Design Conference in Washington, D.C., held at the Convention Center on September 10-12. The ASLA’s annual conference involves, tours, workshops, educational sessions, people trying to sell design-type stuff (like Crate & Barrel’s indoor sitting area in a hallway of the conference center), and well, lots of sitting. Majora Carter, founder of Sustainable South Bronx, is a keynote speaker along with Richard Jackson of UCLA’s School of Public Health. I attended a session called “Retrofitting Surburban Corridors” that highlighted some of the mixed-use options for development in low-density, suburban areas. The planners and designers who presented — all based in the Baltimore region — discussed the conflict of malls and Big Box stores with smart design. They also discussed how to improve five-lane roadways that one presenter called “The Beast.” The session highlighted a few case studies and techniques that can transform a space functioning as a corridor for cars into development that attracts people and incorporates county and state master plans for smart growth. Focus on 3- to 5-storey buildings that encourage multi-use, as opposed to a 1-storey sprawling building. 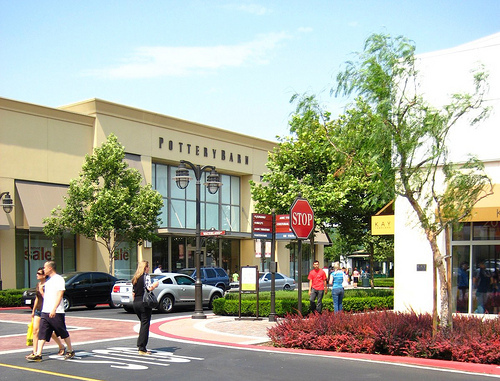 Focus on connectivity: Strip malls can link to other strip malls so people are easily able to walk from one to the other. Establish mixed-use zoning: Apartments above a grocery store might seem unusual but it encourages clustered development and stronger communities. Be creative about design: There are examples of Big Box stores integrating themselves more sensitively with their surroundings. For example, a Wal-Mart could be located behind and restaurants placed in front. And the store could have a smaller, less visible entrance with parking in the back, not the front. Rather than a blank wall, it’s possible for these stores to have a more varied relationship with their surroundings. Matthew D’Amico, Design Collective, Inc.